Old Gold or light brown leather helmet, forest green stripe from side to side, forest green stripe from front to back. 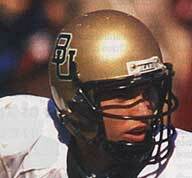 The predominant look for Baylor's leather football helmet era. Dates worn are uncertain. Old Gold shell with forest green stripe. 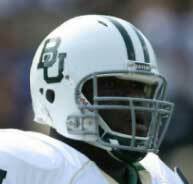 Baylor wore this helmet through the 1940s and into the 1950s. Dates are uncertain. Helmet shells are Riddell RK. Old Gold shell with forest green stripe and lucite mask. 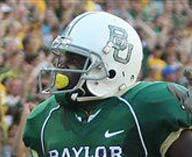 Baylor added Lucite facemasks to the helmets during this period. Helmet shells are Riddell RK. 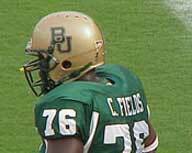 Old Gold shell with forest green stripe, forest green player numbers on sides, gray facemask. Baylor added numbers for one season. Old Gold shell with forest green stripe, white player numbers on side, plastic facemask. Facemasks were added, along with white player numbers. The numbers would remain through the first season of Coach John Bridgers. Old Gold shell with forest green stripe, plastic facemask. These unusually shaped helmet were worn, without side numbers, for one season only. Helmet shells are Wilson. 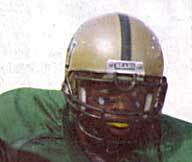 Old Gold shell with forest green stripe, gray or white plastic facemask. Helmet returned to a more "normal" shape, but without the player numbers on the side. Helmet shells are Riddell RK, TK and Wilson. Old Gold shell with forest green stripe, forest green player numbers on sides, gray or plastic white facemask. 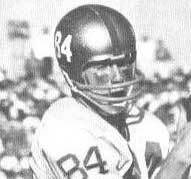 The player numbers were added again in a different color for the 1966 season under Coach Bridgers; however, not all players wore numbers on their helmets. Helmet shells are Riddell. White shell with forest green-yellow gold-forest green stripes and forest green interlocking "BU" on sides, gray facemask. NEW INFORMATION: For some reason, Baylor DID NOT wear decals for the first four games of the 1970 season. Interesting helmet design ushered in during the tumultuous tenure of Coach Bill Beall. 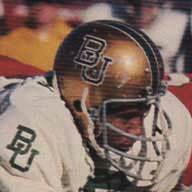 Also, Baylor wore the "100" anniversary sticker on the back of these helmets in 1969, centered at the back of the helmet over the stripe. Helmet shells are Riddell, McGregor, and Wilson. Old Gold shell with forest green stripe outlined with two thin white stripes, with forest green "BU" interlocking outlined in white, and gray facemask. Each letter individually outlined in white. This helmet made its debut in the first coaching year of Grant Teaff. 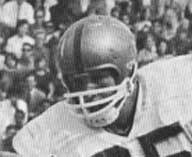 This helmet went virtually unchanged during Grant Teaff's tenure, except for replacing the gray mask with a black mask beginning in 1979. Helmet shells are Macgregor and later, Kelley. Old Gold shell with forest green stripe outlined with two thin white stripes, with forest green "BU" interlocking outlined in white, and black facemask. Each letter individually outlined in white. 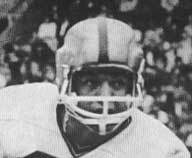 Essentially the same helmet as above, with the addition of the black facemask. Contrary to some information, the mask was black. 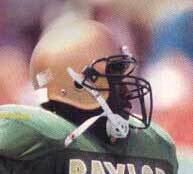 Baylor never went to a forest green mask until the late 1980s. Helmet shells are Kelley (interior painted) and later Maxpro. Old Gold shell with forest green facemask. Worn for only a few games during this season, after fans complained about the lack of the traditional interlocking "BU," the BU was later added. 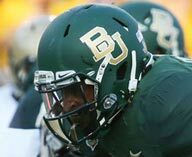 Another reason was that Baylor changed helmet manufacturers, and the helmets had to be sprayed after every game, thus making decals tedious. Helmet shells are Riddell. Old Gold shell with interlocking "BU" in forest green outlined in white, forest green stripe outlined in thin white stripes, forest green facemask. Each letter individually outlined in white. 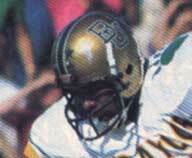 Due to fan and alumni pressure, Baylor added the BU sticker and the green stripe on the helmet for the remainder of the 1992 season, which was Grant Teaff's last year. Helmet shells are Riddell. Old Gold shell with interlocking "BU" in forest green outlined in white, forest green facemask. Note that each letter no longer individually outlined in white. 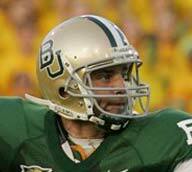 A transition year, in which the stripes were removed, but the classic green "BU" outlined in white was retained. This season marked the last year that Baylor wore the lighter "Kelly Green" jerseys with gold numbers outlined in white. Helmet shells are Riddell and Schutt. Old Gold shell with interlocking "BU" in forest green (no outline) forest green facemask. 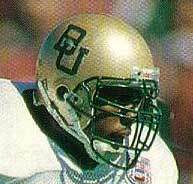 Baylor Bears Coach Chuck Ready changed the "BU" to a plain look, and took away the stripes. Helmet shells are Riddell and Schutt. Old Gold shell with interlocking "BU" in forest green outlined in white, forest green facemask. A return to the white outlined "BU" on the sides of the helmets under Coach Dave Roberts, and continued under Coach Steele. Helmet shells are Riddell and Schutt. Vegas Gold shell with interlocking "BU" in forest green outlined with thin dark green, forest green stripe, forest green facemask. 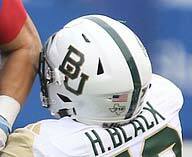 The stripe finally returns to the Baylor helmet for this year, albeit without a white outline. 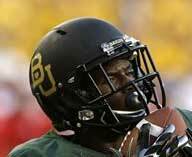 First time since 1992 that Baylor has worn a stripe on the helmet. Helmet shells are Adams and Riddell. Vegas Gold shell with interlocking classic "BU" in forest green outlined in white, forest green stripe, forest green facemask. 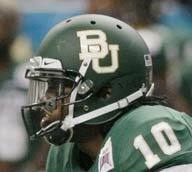 Baylor paid homage to the 1974 "Miracle on the Brazos" SWC championship team by wearing "throwback" uniforms and helmets for one game in 2004. The throwback isn't quite accurate, as the current Vegas gold shell and single dark green stripe (with dark green mask) is used. Just the old decal style is substituted. "Oregon" Green metallic shell with white classic "BU" outlined in gold, with forest green facemask. Green helmet used for all road games in 2007. Helmet shells are Riddell, Riddell Revolution, Adams. Vegas Gold shell with interlocking dark green "BU" outlined in white, dark green-white-dark green stripes, gray facemask. Introduced in 2008, with throwback gray masks and a return to the interlocked classic BU outlined in white. Used interchangeably with the new white helmets for 2009. White shell with interlocking dark green "BU", dark green-white-dark green stripes, gray facemask. New alternate helmet introduced in 2009, worn at both home and road games. 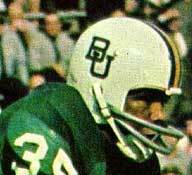 First time that Baylor has worn white helmets since the ill-fated Bill Beall years of 1971. Last worn 2012. White shell with interlocking camoflage "BU" outlined in dark green, dark green-camoflage-dark green stripes, gray facemask. New alternate white helmet for 2010, worn on September 11 to commemorate the date. Green matte finish shell with interlocking white "BU" outlined in gold, forest green facemask. New green helmet worn for 2011 Alamo Bowl. Helmet worn again for 2012 Holiday Bowl. New white helmet for 2013. One of several worn by the Bears for this season. Green matte shell with interlocking metallic gold"BU" outlined in white, dark green facemask. New green helmet introduced in 2013. Gold polychrome shell with interlocking dark green "BU" outlined in gold, polychrome gold facemask. New polychrome helmet introduced in 2013. Black matte shell with interlocking metallic gold"BU" outlined in dark green, black facemask. New black matte helmet version introduced in 2013 assumably to partner with the all-black uniform (ugh!) at home. Worn with green jerseys as well. 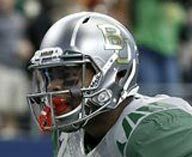 Silver matte shell with interlocking metallic gold"BU" outlined in dark green, silver/chrome facemask. 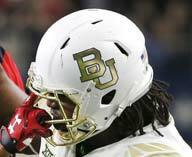 Another new Baylor helmet. The tendency of teams to wear non-school colors is getting a bit old. 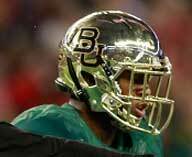 Baylor is becoming the Oregon of the Southwest with the multitude of helmets/uniforms. White shell with interlocking metallic gold"BU" outlined in dark green, gold/chrome facemask. 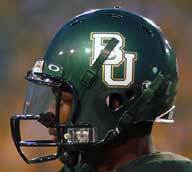 New Baylor helmet. First worn in 2016 in the Texas Tech game and worn on 9/20/17 against Kansas State. White shell with interlocking dark green "BU" outlined in gold, dark green stripe, dark green facemask. 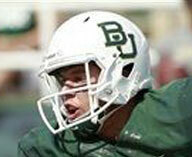 Another new white shell Baylor helmet.